pAtti : Welcome kids , hope you all remember our last discussion . Children (in chorus) : Hello pAtti , yes we do, and we are here to listen more about ashta dhik gajangaL . pAtti : Sounds good , Let us start discussing . parASara : pAtti, ashta dhik gajangaL means 8 Sishyas. Am I right pAtti? pAtti : parASara, you are right , ashta dhik gajangaL are the 8 primary Sishyas of maNavALa mAmunigaL. 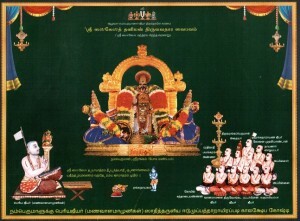 ponnadikkAl jIyar, kOyil aNNan, pathangi paravasthu pattarpirAn jIyar, thiruvEnkata jIyar, eRumbiappA, prathivAdhi bhayankaram aNNan, appiLLai, appiLLAr. These great Sishyas of mAmunigaL were most influential in the growth of our sampradhAyam after mAmunigaL’s times. Let us start with ponnadikkAl jIyar who was prANa sukruth (dear like life) to his AchAryan maNavALa mAmunigaL . pAtti : Born as azhagiya varadhar, he became to be famously known as ponnadikkAl jIyar. parASara : pAtti, why he is called as ponnadikkAl jIyar ? pAtti : ponnadikkAl means the one who laid the foundation of mAmunigaL’s Sishya sampath (i.e. wealth of Sishyas). ponnadikkAl jIyar was held as purushakAram by many AchAryas to approach mAmunigaL. mAmunigaL also appointed ashta dhik gajangaL to ponndikkAl jIyar. mAmunigaL instructed ponnadikkAl jIyar to go to vAnamAmalai as dheyvanAyakan emperumAn (vAnamAmalai) sends SrImukam (an instruction) through sEnai mudhaliAr to mAmunigaL that ponnadikkAl jIyar should be sent to vAnamAmalai dhivya dhEsam to look after the kainkaryam there. vyAsa : pAtti, ponnadikkAl jIyar was father-in-law to dheyvanAyakan emperumAn. Am I right ? pAtti : yes vyAsa, correct. ponnadikkAl jIyar was the one to bring nAchiyAr vigraham (divine deity of thAyAr) from thirumalai and arranged a grand wedding with dheyvanAyakan emperumAn and he himself performs kannikAdhAnam. dheyvanAyakan emperumAn proclaimed that “like periyAzhwAr, ponnadikkAl jIyar is also his father-in-law”. He went to various parts of bhAratha dhESam and spread our sampradhAyam based on mAmunigaL’s orders. In the end, meditating upon his AchAryan azhagiya maNavALa mAmunigaL’s divine feet, ponnadikkAl jIyar gives up his charama thirumEni and attains paramapadham. Let us pray at the lotus feet of ponnadikkAl jIyar that we also develop such attachment towards emperumAnAr and our AchAryan. pAtti : Our next discussion is about kOyil aNNan, He becomes one of the dearest disciples and ashta dig gajangaL. An interesting incident happened in the life of koil aNNan , which took him to take the shelter of mAmunigal. parASara : pAtti, what was the incident ?? pAtti : Appreciating your curiosity parASara , Born in the illustrious family lineage of mudhaliyANdAn , he did not want to take shelter of mAmunigaL. The incident brought him back to take the lotus feet of mAmunigaL. kOyil aNNan (as popularly known) was living in SrIrangam with many Sishyas . You all know SrI bhAshyakArar (SrI rAmAnujar) was the one who ordered kOyil aNNan to become the disciple of mAmunigaL. SrI rAmAnujar guided kOyil aNNan and asked to utilise his relationship with mudhaliyANdAn properly. emperumAnAr said “I am Adhi sEshan and have come again as maNavALa mAmunigaL. You and your relatives become the disciple of mAmunigaL and be uplifted”. Children, the whole incident happened in his dream. The dream stops and aNNan wakes being totally shocked. He explains the incidents to his brothers with great emotions. aNNan along with many other kandhAdai family AchArya purushas go to jIyar mutt to take shelter of mAmunigaL. mAmunigaL instructs vAnamAmalai (ponnadikkAl) jIyar to prepare the necessary aspects and performs pancha samskAram to all of them. So Kids , we have seen some glimpses of the glorious life of kOyil kandhAdai aNNan. He was very dear to mAmunigaL. Let us pray at his lotus feet that we too get a little bit of such abhimAnam of AchAryan. Next I will tell about mOr munnAr ayyar (paravasthu pattarpirAn jIyar). He is one of the ashta dhik gajangaL of mAmunigaL. He stayed with mAmunigaL without ever separating from him just like embAr who always stayed with emperumAnAr. vEdhavalli: pAtti, why he is known as mOr munnAr ayyar ? pAtti : Sounds interesting right. 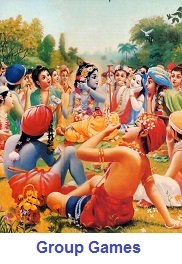 Everyday, he ate the SEsha prasAdham (remnants) of mAmunigaL. He used to consume his prasAdham on the same banana leaf on which mAmunigaL ate. As mAmunigaL finishes with curd rice, paravasthu pattarpirAn jIyar wants to consume prasAdham without changing the taste (from curd to dhAl). Thus, he became to be known popularly as “mOr munnAr ayyar . He learned all the essence of SAsthram from mAmunigaL directly and constantly served him. After mAmunigaL ascended to paramapadham, pattarpirAn jIyar settles down at thirumalai and purify many jIvAthmAs there. Having more AchArya nishtai, he writes a grantham named anthimOpAya nishtai, which fully brings out the glories of our AchArya paramaparai and how our pUrvAchAryas fully depended on their respective AchAryas. He was a great scholar and was very dear to mAmunigaL . pAtti : Kids. next I will tell you about eRumbi appA. His original name is dhEvarAjan. While living and performing his dharmam at his village, eRumbi appA heard about maNavALa mAmunigaL and wished to meet him. eRumbi appA stayed with mAmunigaL for some time, learned all the rahasya granthams and finally returned to his village and continued his kainkaryam there. 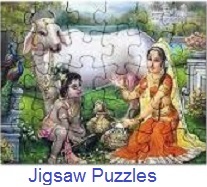 He was constantly thinking about his AchAryan and compiled pUrva and uththara dhinacharyai (which summarizes mAmunigaL’s daily activities) and sent them to mAmunigaL through a SrIvaishNava. mAmunigaL was very pleased to see eRumbi appA’s nishtai and glorified him. He also sent an invitation to eRumbi appA to come and visit him . vyAsa : pAtti, like pattarpirAn jIyar, ponnadikkAl jIyar, eRumbi appA is also more attached towards his AchAryan. Isn’t it so pAtti? pAtti : Right vyAsa. One of the most important contributions of eRumbi appA is “vilakshaNa mOksha adhikAri nirNayam”. This is a compilation of conversations between eRumbi appA and his Sishyas like sEnApathi AzhwAn . vEdhavalli : pAtti, what is vilakshaNa mOksha adhikAri nirNayam ? pAtti : This grantham clarifies many of the doubts that arises out of misunderstanding our AzhwAr/AchArya srisUkthis . eRumbi appA taught us the importance of developing vairAgyam in samsAram and attachment towards our pUrvAchArya’s gyAnam and anushtAnam and guided us to put them into practice . Let us remember eRumbi appA who always remembers maNavALa mAmunigaL. pAtti : Kids, now will discuss about prathivAdhi bhayankaram aNNA. Born as hasthigirinAthar, in the early part of his life, he lived in kAnchIpuram and was blessed by vEdhAnthAchAryar. He became a great scholar and won over many scholars of other sampradhAyams . Later he was living in thirumalA and serving thiruvEngadamudaiyAn. Hearing about the glories of maNavALa mAmunigaL , he decided to join as Sishya to maNavALa mAmunigaL. He reached SrIrangam and visited mAmunigaL’s mutt. mAmunigaL was performing kAlakshEpam and as aNNA heard the kAlakshEpam he understood the great knowledge of mAmunigaL in the various fields of SAsthram. He surrendered to mAmunigaL and became a Sishya. He wrote many granthams on praise of emperumAn and mAmunigaL. 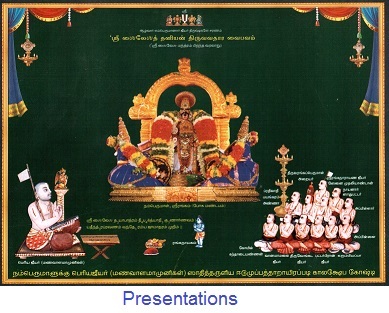 The most popular vEnkatESa suprabhAtham, vEnkatESa prapaththi etc were submitted to thiruvEngadamudaiyAn by aNNA for the pleasure of his AchArya, mAmunigaL. Though they heard about mAmunigaL, they did not have great attachment towards him. But slowly they came to know about the glories of mAmunigaL and even heard that many great personalities such as kandhAdai aNNan, eRumbi appA have taken shelter of mAmunigaL. vEdhavalli: pAtti , how did they become disciples of maNavALa mAmunigaL? pAtti : Yes vEdhavalli , eRumbi appA was the one to inform mAmunigaL that they are ready for AchArya sambandham . ponnadikkAl jIyar says to mAmunigaL “they have been blessed with discussions with eRumbi appA and they have all the qualification to become your Sishyas”. They both asked mAmunigaL to accept them and bless them . Like wise, mAmunigaL did pancha samaskaram to both appiLLai, appiLLAr . appiLLAr is given the responsibility of taking care of jIyar mutt’s all daily activities such as thadhIyArAdhanam. Just like kidAmbi AchAn served emperumAnAr by fully taking care of mutt responsibilities, mAmunigaL was served by appiLLAr. appiLLai writes vyAkyAnams for thiruvanthAdhis per mAmunigaL’s divine instructions and assists mAmunigaL in his many dhivya prabhandham related kainkaryams. During the final days of mAmunigaL, appiLLAr prays to him, and requests him to bless him with archA vigraham (deity) of mAmunigaL for their daily worship. mAmunigaL gives the sombu (vessel) which he uses daily and they use that to prepare two vigrahams (deities) and each keep one vigraham (deity) of mAmunigaL for their daily worship . So kids let us pray at their lotus feet that we too get a little bit of such abhimAnam of AchAryan. Kids so far we discussed about glories of mAmunigaL and his ashta dhik gajangaL . parASara : We learned so much today pAtti. pAtti : Yes dear. I am also going to tell you all something very important now. Listen carefully. Subsequent to the times of mAmunigaL, many great AchAryas continued to bless the devoted ones in every town and village. The AchAryas stayed in dhivya dhESams, abhimAna sthalams, AzhwAr/AchArya avathAra sthalams and other kshEthrams, and shared the knowledge and nurtured bhakthi in everyone. thirumazhisai aNNavappangAr and first SrIperumbUthUr embAr jIyar were from recent past (200 years ago) and contributed significantly to our sampradhAyam through their in-depth granthams and kainkaryams. Whatever knowledge I have shared with you has come through this paramparA of AchAryas. We have to be thankful to them always. Hope you all had a nice time . Our mind, senses and body and should be engaged in kainkaryam to such AchAryas, AzhwArs and emperumAn. Alright, it has become dark. Let us think about the AchAryas and complete our session today. Children : Thank you pAtti. This entry was posted in Beginner's guide, Others, Stories on July 10, 2018 by janani. parASara, vyAsa, vEdhavalli and aththuzhAy enter ANdAL pAtti’s home with full curiosity as they are going to learn about the Sishya’s of piLLai lOkAchAryar. pAtti: Welcome children, How are you all? I could see excitement in all your faces. vyAsa: Hello pAtti, we are doing good! How are you patti? Yes pAtti you are correct we been eagerly waiting to hear about the sishyas of piLLai lOkAchAryar. pAtti: Yes kids, even I was waiting to share with you all. Hope you all remember our last discussion. Can any one tell me his sishyas’ names? aththuzhAy: pAtti! I do remember the names. kUra kulOththama dhAsar, viLAnchOlaip piLLai, thirumalai AzhwAr (thiruvAimozhip piLLai), maNapAkkaththu nambi, kOttUr aNNar, thirupputkuzhi jIyar, thirukkaNNangudip piLLai, kolli kAvala dhAsar. pAtti: Very nice aththuzhAy, glad that you kids remember. Now let us discuss in detail. 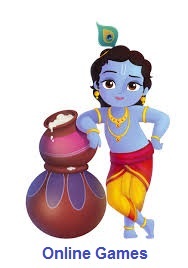 First, I will tell you all about kUra kulOththama dhAsar. pAtti: kUra kulOththama dhAsar was born in SrIrangam. His role was very important in bringing thirumalai AzhwAr (thiruvAimozhip piLLai) back to our sampradhAyam. He was close associate of piLLai lOkAchAryar and he travelled with piLLai lOkAchAryar during thiruvarangan ula (when namperumAL travelled to various places during muslim invasion). mAmunigaL glorifies kUra kulOththama dhAsar as “kUra kulOththama dhAsam udhAram” (one who is very merciful and generous) because of his unlimited krupai of taking many efforts to reform thirumalai Azhwar. Eventually, thirumalai AzhwAr became so grateful and surrendered to kUra kulOththama dhAsar that he always lived with dhAsar serving him and left to AzhwArthirunagari only after dhAsar’s ascending to parampadham. In SrI vachana bhushaNam, it is said that for a Sishya “AchArya abhimAname uththAragam“. This absolutely suites kUra kulOththama dhAsar and thirumalai Azhwar. So let us all remember kUra kulOththama dhAsar who always remembers the feet of piLLai lOkAchAryar. vEdhavalli: pAtti, we are all happy to hear about kUra kulOththama dhAsar. We all learned how a Sishya should respect Acharyan. pAtti: Yes vEdhavalli everyone should remember “AchArya abhimAname uththAragam”. Now we will learn another important Sishya named viLAnchOlaip piLLai. vyAsa: pAtti, I already know why he is called viLAnchOlai piLLai. He used to climb “ViLam” trees to get dharSan of the gOpuram of the thiruvananthapuram, padhmanAbha swAmi temple. pAtti: Very good vyAsa,you are right. Being born in eezhava kulam, he was not allowed inside the temple. So to have dharSan of perumAL, he will climb “viLam” tree and perform mangaLASAsanam. Due to piLLai lOkAchAryar’s grace, he learned eedu, SrI bhAshyam, thathva thrayam and other rahasya granthams from azhagiya maNavALap perumAL nAyanAr, who is the younger brother of piLLai lOkAchAryar. viLAnchOlai piLLai learned SrI vachana bhUshaNam from his Acharyan piLLai lOkAchAryar. He become an expert in the meaning of SrI vachana bhUshaNam. He wrote “saptha gAthai” which is the essence of his AchArya’s SrI vachana bhUshaNam. parASara: We are greatly surprised seeing viLAnchOlai piLLai”s attachment towards his AchAryan. pAtti: Yes, parASara! One of the biggest kainkarayams he did was to follow his AchAryan’s instructions in reforming thirumalai AzhwAr. 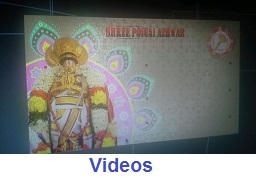 piLLai lOkAchAryar wanted viLanchOlai piLLai to teach the meanings of SrI vachana bhUshaNam to thirumalai Azhwar. Children! Now, I would like to share one important incident happened in the life of viLAnchOlaip piLLai. aththuzhAy: pAtti, please tell us about the incident. One day nambUdaris were doing thiruvArAdhanam to padhmanAbha swAmi. viLAnchOlai piLLai entered in to the temple. As we all know, the sanctum has three doors to facilitate our dharSan of perumAL. viLAnchOlai piLLai stood near the door that gives dharSan of perumAL’s lotus feet. Seeing all this, nambUdaris became shocked, as he was not allowed inside the temple premises those days. nambUdaris closed the door of the sannidhi, started to move out of the temple. At the same time, some local Sishyas of viLAnchOlai piLLai approached the temple and announced that their Acharyan viLanchOlai piLLai has left his body and reached the lotus feet of his Acharayan piLLai lOkAchAryar. They wanted “thirupariyattam” (emperumAn’s vasthram as prasAdham) and emperumAn’s garlands for the charama thirumEni (final sacred body) of viLAnchOlai piLLai. Hearing this nambUdharis became shocked and understood the greatness of viLAnchOlaip piLLai. He then offered perumAL’s thiruppariyattam and garlands. vEdhavalli: pAtti, I had goose bumps hearing about viLAnchOlai piLLai final moments. vyAsa: Yes pAtti, I am also getting happy tears from my eyes. This truly explains how a person from “eezhava kulam” is glorified in our sampradhAyam. pAtti: Alright kids, I had a nice time with you all. Hope you all will remember what we discussed today. Next time, I will tell you in detail about thiruvAimozhip piLLai, see you all soon. All the kids left Andal patti’s home with full energy and happiness thinking about the discussions. This entry was posted in Beginner's guide, Others, Stories on May 3, 2018 by janani.